Hillary Clinton has come out of the woods. She has a new super PAC aimed at funding organizations fighting the Trump agenda. It will eventually be the war chest for 2018 midterm candidacies. She herself says she’s a member of the resistance. 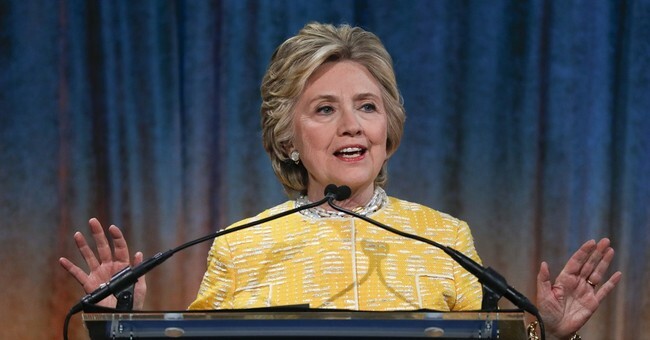 And she obviously hasn’t made her peace with losing to Donald J. Trump, who she reportedly feels is a “dumb, soulless manipulator.” Axios broke down her seething rage over losing from New York Magazine’s Rebecca Traister’s lengthy piece about Hillary post-campaign. One thing we have seen from the former secretary of state and two-time presidential loser is her inability to take full responsibility without blaming someone else. Her favorite targets are former FBI Director James Comey and the Russians. Yet, in Traister’s piece, everywhere the former first lady goes there are her supporters trapped in glass cases of emotion, still shocked over last November’s results. "Almost everywhere Clinton goes, it seems, someone starts crying. ... At restaurants, in grocery stores, on planes, and in the woods, there are lines of people wanting selfies, hugs, comfort." "I had people literally seeking absolution. ... 'I'm so sorry I didn't vote. I didn't think you needed me.' I don't know how we'll ever calculate how many people thought it was in the bag, because the percentages kept being thrown at people ... I never bought any of that, but lots of people did." "Part of what my opponent did, which was brilliant ... was blow the top off: You can say whatever you want about anybody else, and I'll tell you who to be against. I'll tell you who you should be resentful of." The stories her campaign tried to tell, she says, "were boring in comparison to the energy behind malicious nostalgia." So, wanting policies that spur job creation and economic growth is “malicious nostalgia”? Wanting better trade deals is “malicious nostalgia”? Wanting border security and a crackdown on illegal aliens who are breaking our laws, committing murder and drunk driving—is that “malicious nostalgia”? Keeping jobs in America—is that “malicious nostalgia”? Also, Hillary, your stories were crap because you had no message. You had zero economic messages, everyone knows you’re married to Bill, everyone knows you have experience, but you gave little to no attention to the vast swaths of voters who feel left behind. You also said that anyone who supported Trump was deplorable. Also, you really couldn't tell a good story because everyone was wondering whether you comprised our national security by having an unauthorized and unsecure email server from which you conducted all your State Department business. Your endless trip-ups in explaining that arrangement only led to more voters seeing you as untrustworthy and dishonest. You ignored tens of million of white working class voters because you thought they didn’t matter. The diverse urban areas would carry you. Wrong. The people who live there didn’t like you. You did not impress the people who live there. They knew you were not Barack Obama, who promised many in the Rust Belt that things would get better. Things remained the same; so even Democrats in rural America were not shocked by Trump’s win. Also, these folks are facing economic hardship, the opioid crisis is out of control, and some are working two jobs to pay the bills, while those on welfare are living better. Is that “malicious nostalgia”? The Guardian’s Chris Arnade, who noted that there are two Americas—a front seat and a back seat, reported that latter part about welfare. In Youngstown, Ohio, 60-year-old Bill Golec, a Democrat, and a police officer that repairs lawnmowers on the weekend for extra money made that observation. This campaign wasn’t driven by racism. Remember millions of voters who supported Obama flipped for Trump, even known lefty Michael Moore said that it’s a bit absurd to say racism played a role when these people voted for a man named Barack Hussein Obama, some of them twice. In the end, a lot of Obama-Trump voters couldn’t stand Hillary Clinton and a good chunk thought that her agenda favored the wealthy. Is it “malicious nostalgia” or the fact that Hillary Clinton was a sucky candidate, who marginalized tens of millions of people because she thought they didn’t matter? On top of that, having zero economic messages other than I’m a Democrat, so vote for me. I think you were just a terrible candidate, Hillary. And many Democrats feel the same way.